Pioneer CLD-79 Elite LaserDisc CD CDV Player AC-3. Classic Laserdisc player with the coveted AC-3 output. Everything works good. Though sometimes you have to open and close the tray to get player to read discs. Does this on LD’s and CD’s. Probably just needs a cleaning. Dent on top back of the unit. See pictures. I also have over 300 laserdiscs I’m selling but they are pick up only . Shipped with USPS Parcel Select Ground. Up for sale is a Pioneer Elite DVL-91 Laserdisc / DVD Player MINT CONDITION. Shows normal wear but nothing close to major in my opinion. Looks good for its age and plays well. No remote included. Only the item described and photographed will be included in the sale. Pioneer Elite DVL-91 Laserdisc / DVD player, with remote. Tested with laserdisc and dvd, both working. Comes with working remote and power cord. 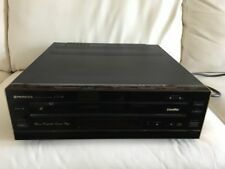 Up For sale Jack has this Pioneer Elite LD-S2 LaserDisc Player Parts or Repair (HSE). Front door is loose on left hinge. Unit powers up and opens. Doesn't respond with disc inside. No remote. Being sold as is. Reference Laserdisc Player. PIONEER HLD-X0. Reference Laserdisc Player. PIONEER DVL-H9. Exceptional Pioneer design. This thing is an easy 9.5/10. Looks, sounds, and shows excellent. The face is shiny, the body is great too. Truly a rare find! We ship same or next business day in bubble wrap, foam, and air pillows when feasible. We strive for positive feedback, thanks for bidding! Up for Sale is 1 Pioneer Elite DVL-91 Laser Disc /DVD/CD/CD-R Combination Player & 70 Laser Discs. I’m the original owner and the unit is in excellent condition. Everything works perfectly. Copper Chassis for Superior Shielding Large Insulating Feet. Brand: Pioneer Condition: This is a Vintage item. It is Fully Functional and Corks Completely. It has been used and shows signs of Wear as seen in pictures, but is generally in Good Cosmetic Condition. I Personally look over my items to assure they are in Good Condition. Model Number: DVL-90 Item Specifics: Pioneer Elite DVL-90. Plays CDs, DVDs, and Laserdiscs. Has Autoflip. IT POWERS ON BUT THE MACHINE CANNOT READ THE DISC. -SERIAL NUMBER: LF3903163T. -MANUFACTURED: JUNE, 1991. -MADE IN JAPAN. -120V 60HZ. "The sale of this item may be subject to regulation by the U.S. Food and Drug Administration and state and local regulatory agencies. Will-Call Hours 1988 E. Alpine Ave. The unit powers on the the disc drawer opens but it will not recognize / play the disc. make Supersized seem small. All the movies are the best of the LD era, no garbage. PIONEER CLD-95 - ist ein HighEnd Laserdisc Player der ELITE Edition von Pioneer. Dieses Gerät kann Laserdiscs und CD's in NTSC abspielen. Das heißt im Falle eines unverschuldeten technischen Defekts erfolgt eine Reparatur oder Austausch der Ware, dies gilt in jedem Land.